Electrical Fan Fail light blinks bright and dim?? [Electrical] Fan Fail light blinks bright and dim?? Thread: Fan Fail light blinks bright and dim?? Fan Fail light blinks bright and dim?? I'm still running the original factory fans on my car coupled with Dave McKeen's light blue fan fail relay with the two small fuses on the top. Took the car out Saturday for a 400+ mile round trip cruise down the Natchez Trace Parkway and noticed about an hour into our trip, the fan fail light on the dash panel starts flashing really bright (it does has LED's in the panel) . Pulled over on the side of the road and crawled under the front end of the car and BOTH fans are blowing just as they should be. Figured it was a glitch in the system somewhere. Stopped for gas in Florence, Alabama and when I restarted the car... No flashing fan fail light. 30 minutes later it starts flashing again. I ignore it this time because I can hear both fans running. The longer we drive, we see the fan fail light getting dimmer. By the time we got home it was still flashing, but just faintly visible. New fans are on my list for this year, but what gives with the bright flashing and dim flashing? You’ll need too ask Dave that question directly. He has his FF module setup to read current differential between the two circuits. You may have a faulty FF module that overheated. You will need to pull the module and examine it for signs of heat blistering. I had a Gen 1 version of that unit that failed with heat stress showing. I was also running the OEM fans. Just curious, do you have his Fan Relay and were you using A/C during your trip? Dennis is correct. We'll need to hear Dave chime in. The fan fail module with the fuses generates heat when paired with high draw OEM fans. I think its the fuses that act as a heating element. Dave's documentation says to look for three consecutive blinks to indicate overheating of the fan fail module. The suggestion is to pull off the relay compartment cover if this happens to try and keep the module cool, and, when you can, instigate the power draw. As the original fans age, they come to a point where the current they draw begins to increase. This increase will eventually overtax the relays and fuses in the circuit. I'm also curious as to why your fans were running. This time of year the outside temperature shouldn't be overly hot. The fans shouldn't even be running with the car cruising. But maybe you were uncomfortable and had the AC on? If not, you may want to troubleshoot and find out why they are running. Let me know what revision fan fail unit you have. My first units did a fan current measurement and you could adjust what current compare it used to blink a failure. But the light should not be dimming. The dimming would make me think your ground connection on the relay socket is not good. I now only sell a fused fan fail unit that does not measure fan currents. It just monitors fan voltage and that the unit does not overheat. Yes the heating of the unit is mostly from the fuses. The older fused units did run a little hotter since they also measured current which generated some more heat. Just pulled the cover off of the relay compartment. That fan fail module is toast. 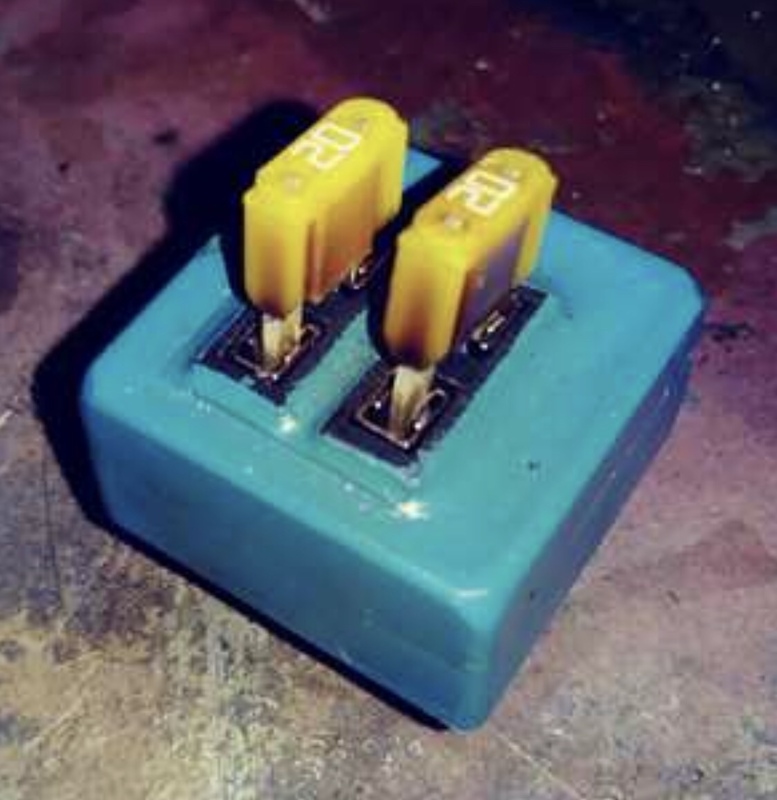 Both fuses on top look melted and discolored, and the socket looks a little melted as well. The temperature outside on Saturday here was probably in the mid 50's, so we did not have the A/C running. Both fans were running, but the coolant temp gauge never climbed above the normal operating range. Probably going to have to use the DMCH fused jumper until I can replace the module with a updated later version. Cold temperatures and winter weather means the car won't be going anywhere anytime soon. I'll have plenty of time to work on it in the next several months. Keep an eye on the jumpers. Must be your OEM fans are really drawing a lot of current. Very odd to have both fans running in that scenario. The fans should not run at all if the Mode switch is off. The FF module is just a circuit splitting pass thru device. The Fan relay is what switches power on/off via commands from either the Otterstat or Mode switch. When you pull the fan fail, look on the bottom and let me know what revision it is. My current version I made the unit flash if the unit started getting to hot. Dave, It appears terminal 87 is missing or the soldier melted away leaving the spade in the socket.